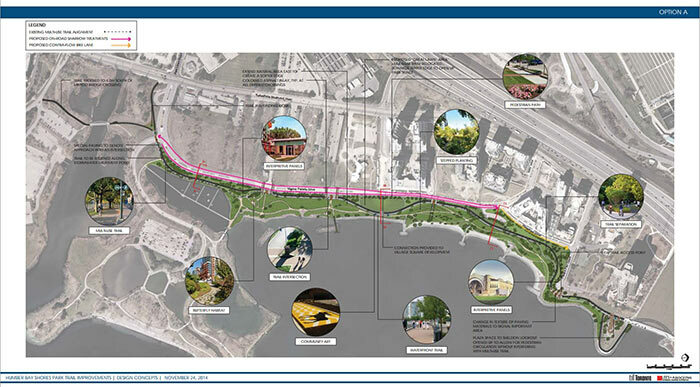 Last week, a public open house was held to review plans for Humber Bay Shores Park trail improvements. There were some good ideas presented, but so far, the suggested improvements would only deal with the level of use the trails sees today, not the increased use it will see five of ten years from now. Full details, including the display boards from last week’s open house, are on the City’s Project Website. CCFEW has not submitted formal comments yet. Humber College has been planning a Welcome Centre for several years. We knew that they were negotiating with the City to use a piece of city owned property at the Corner of Kipling Ave. and Lake Shore Blvd. W. We thought there would be some public consultation on this, but the fence and the signs went up last week, so it appears to be a done deal. There are still rumours of a public meeting, but one must assume at this point that will be informational rather than consultation. You can click on the artist’s rendering below to view a higher resolution version. 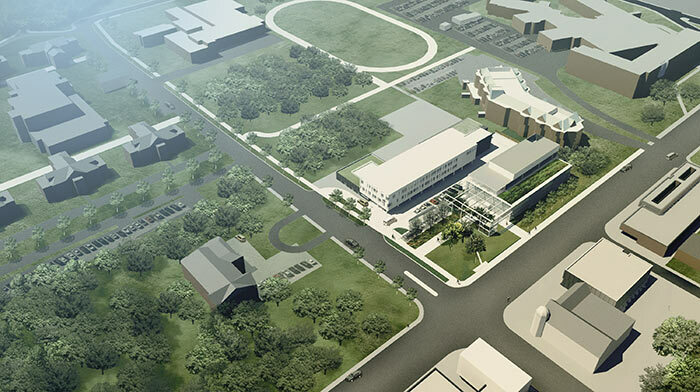 The long white building illustrated beside the Welcome Centre is the planned TCDSB elementary school. 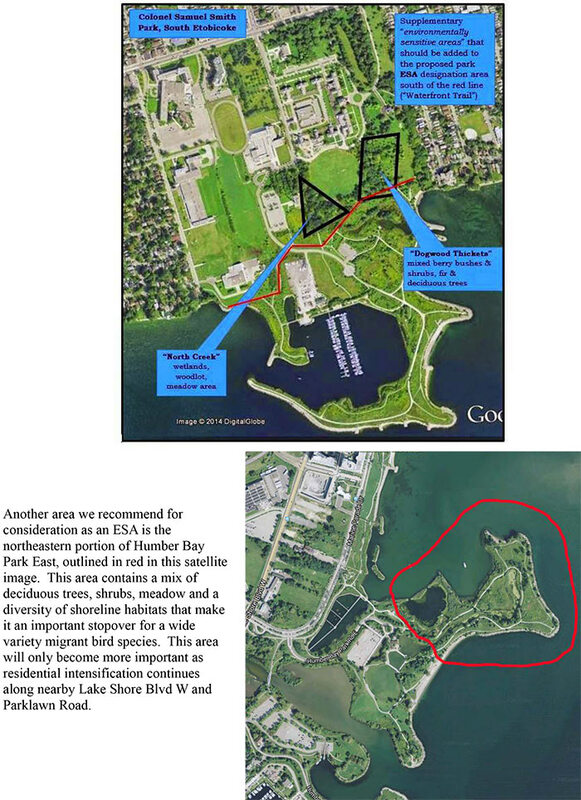 Update: Humber College has provided this information package (5 page pdf) about the project. Nice, but did it have to go on City owned greenspace? Toronto’s mayoral race gets plenty of media attention, but you local voice on council gets practically none. That’s why Position Primer is a very helpful website. They list every council candidate in every ward, their contact information, and their responses to questions on a wide range of issues. 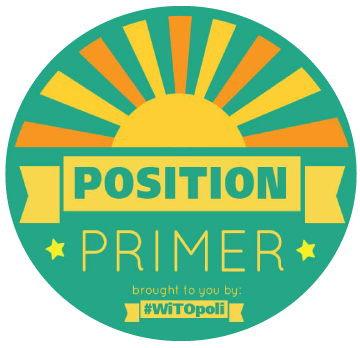 Position Primer was created by WiTOpoli. The City of Toronto is studying the addition of 68 new Environmentally Significant Areas under the City’s Official Plan, and Colonel Samuel Smith Park is one of them. You can read the Staff Report here. There will be study and consultation before a recommendation goes to council next year. What does the designation mean? 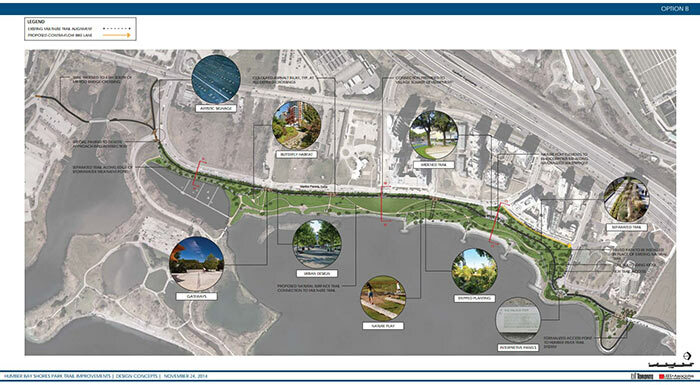 This is the only new proposed designation on the Etobicoke waterfront, although there is a new area proposed on the Etobicoke Creek, north of the Queensway and a couple of proposed expansions to an existing ESA on the Humber River south of Bloor Street. At their July 8-11 meeting, City Council approved the non-watered down version of the motion to begin the process of designating these river and creek valleys as Urban River Valleys under Ontario’s Greenbelt designation. 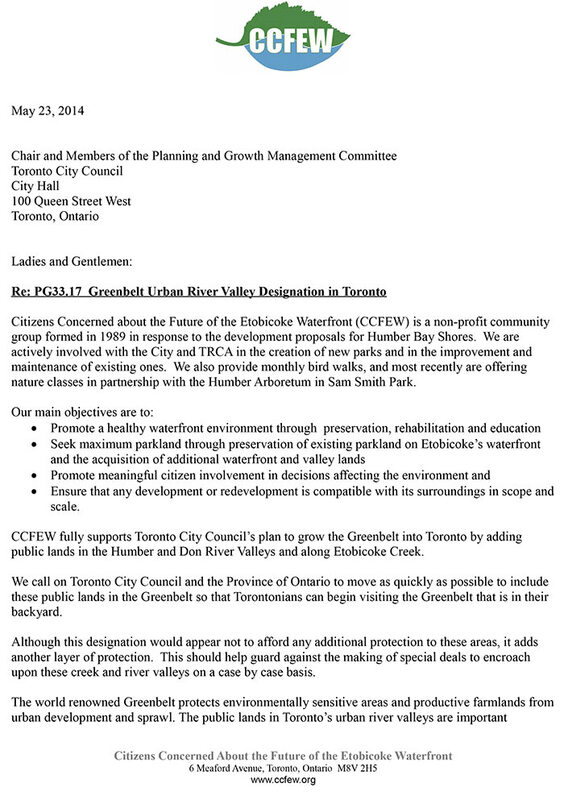 CCFEW is supporting an initiative that would see the City of Toronto designate the Don River, Humber River and Etobicoke Creek as Urban River Valleys as part of Ontario’s Greenbelt. 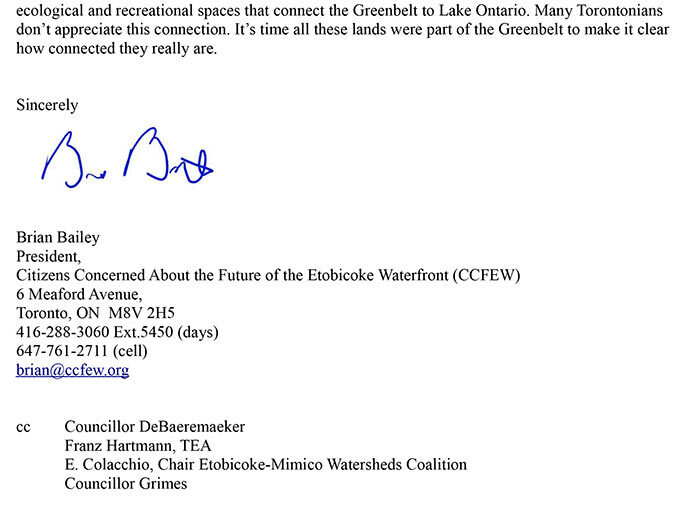 (Mimico Creek doesn’t qualify because it doesn’t reach the existing Greenbelt.) While rivers and creeks are protected by current municipal legislation, we know that isn’t always enough. An extra layer of protection would be welcome. 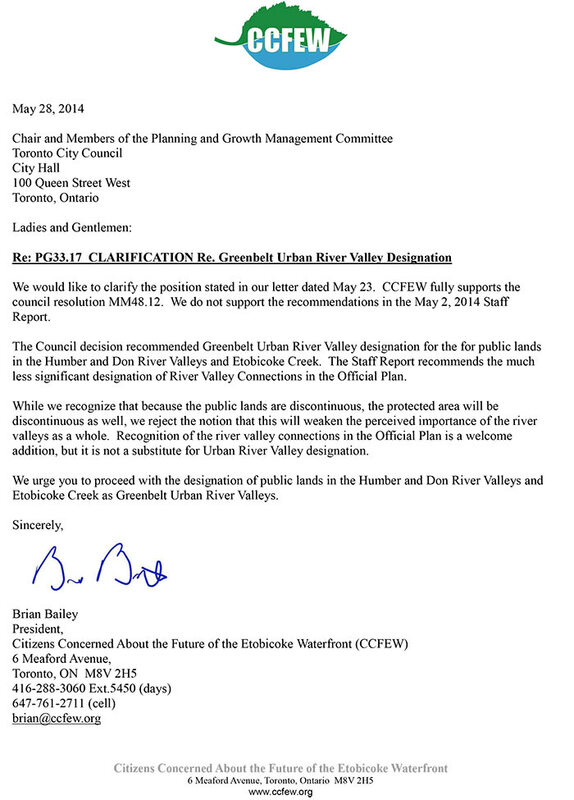 This designation would bring real additional protection to those valleys and give Torontonians a tangible connection to the Greenbelt. 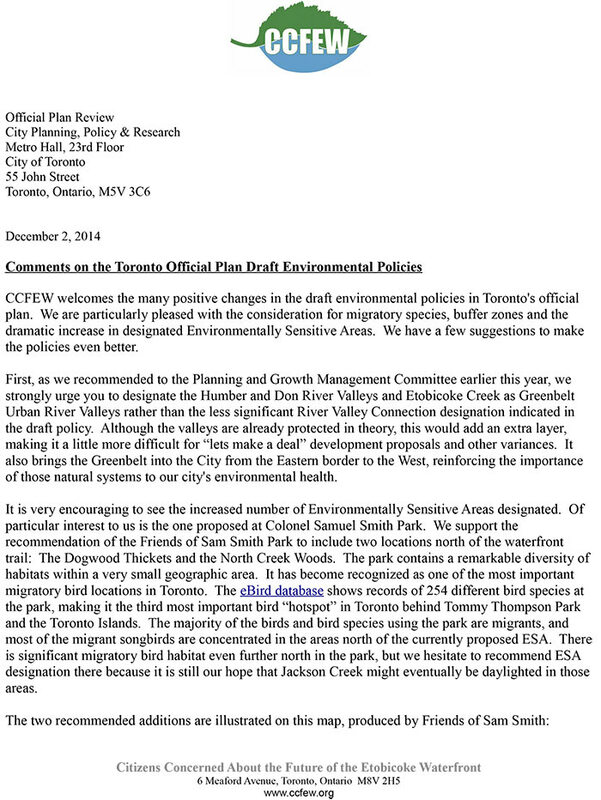 It will also give Toronto a seat at the table when the Greenbelt legislation comes up for periodic review. The matter has now been deferred to the June 19th meeting of the Planning and Growth Management Committee. 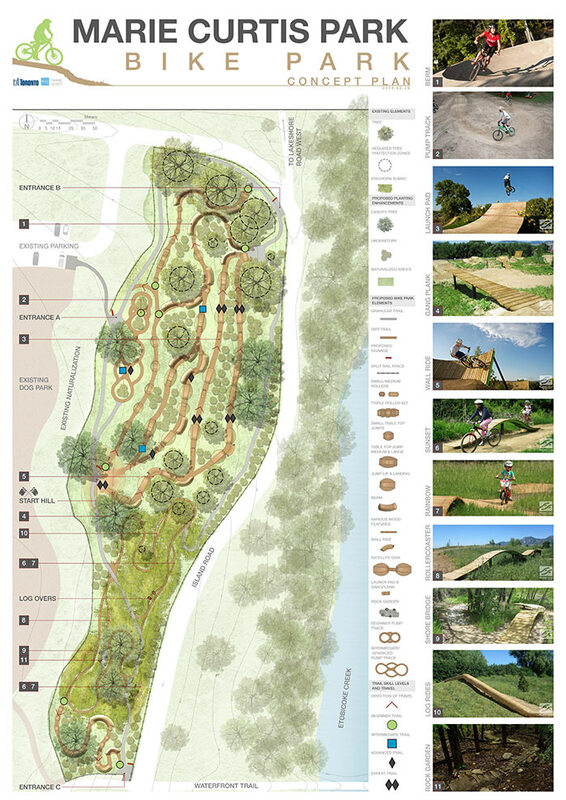 There is now a concept plan of the Marie Curtis Park Bile Park online. This feature is planned for the west side of Marie Curtis Park, between the dogs off leash area and the park road. The intent of the park is to give riders a place to practice and build their off-road skills without damaging sensitive woodland habitat. 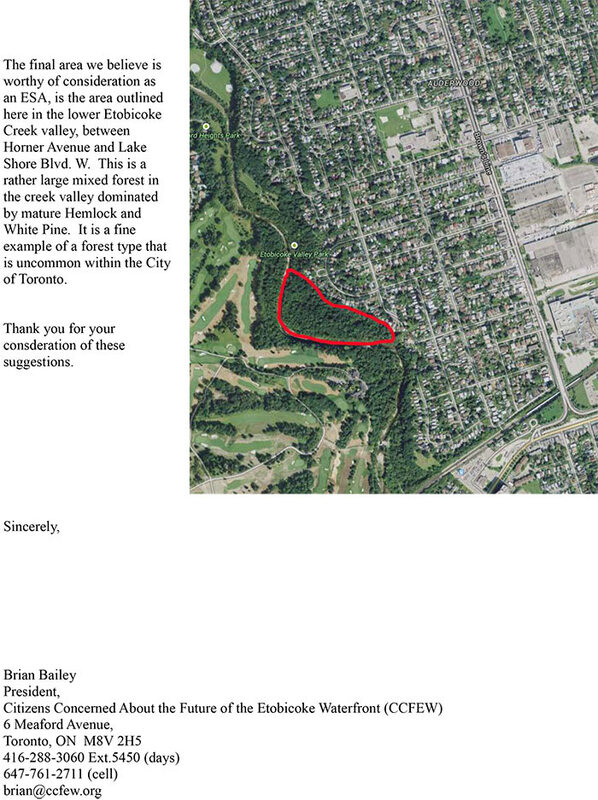 Nearby woodlots are suffering from unofficial trails and structures currently in use for these activities. We are hopeful that this will be a successful strategy. There is a 3 phase build-out plan, but there is currently no funding in place for the project. You can find our more on the City of Toronto page here. 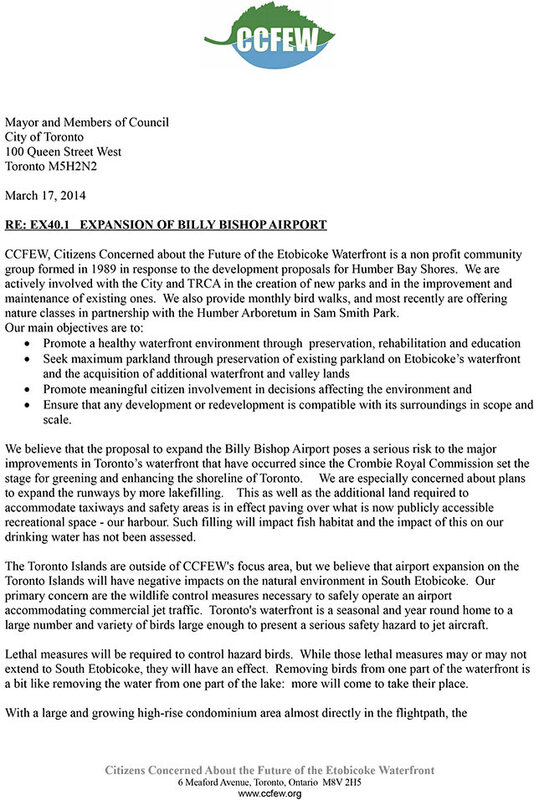 While most of us have personal opinions about expansion of the Billy Bishop Airport, it is well outside the borders of South Etobicoke, so we had not initially viewed it as a CCFEW issue. It has become clear however, that the proposed expansion will have negative environmental impacts that will spill over to South Etobicoke. As of this past Thursday, there were already 1000 students registered for the Nature Education programs at Colonel Samuel Smith Park, fully exhausting our $4000 of third party funding. CCFEW will be supplementing that with another $750 of our own funds plus some unused funds pledged from 2013. After a slow start in their first two years, these programs, offered by the Humber Arboretum, are hitting their stride in year three. This means that over 1200 students and teachers will get to experience hands-on environment and nature studies curriculum without leaving the city, or in some cases, even their own neighbourhood. CCFEW is pleased to announce that we are continuing to support the new Nature Programs being offered at Colonel Samuel Smith Park in south Etobicoke, at Kipling and Lake Shore Blvd. West, in the spring of 2014, provided by the Humber Arboretum. These programs are based on the Ontario Science curriculum , and are led by nature interpreters from the Humber Arboretum in north Etobicoke. CCFEW is offering to subsidize these nature programs for classes again this spring. CCFEW has just obtained very generous grants from The Gosling Foundation and The McLean Foundation which has enabled us to offer these subsidies- but they may go fast. For more information, or to register for one of these programs, contact the Humber Arboretum directly at 416-675-5009, or go on their website at www.humberarboretum.on.ca. Look under “Lakeshore School Programs”. Be sure to mention the CCFEW subsidy if you are booking a program. We hope to see you at Colonel Sam this year! It has come to our attention that in discussions about the proposed community garden at Colonel Samuel Smith Park, objections by an “ornithological group” have been mentioned. Many people assume that group is CCFEW. It is not. 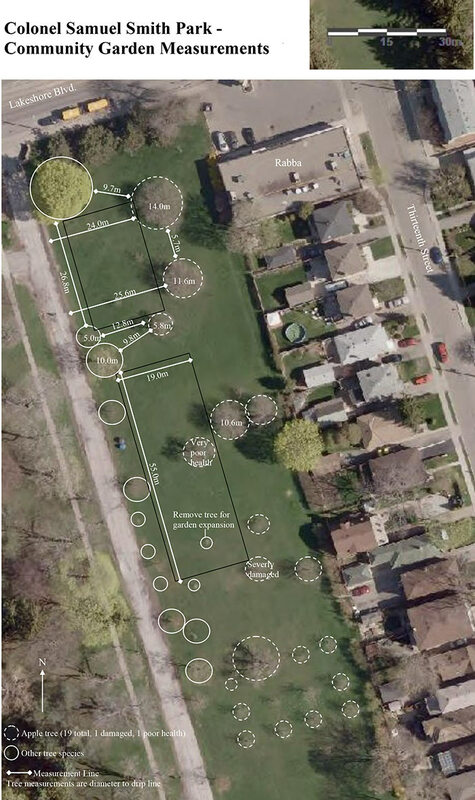 I would like to clarify that CCFEW does not object to a community garden at the proposed location in the northwest corner of the park, near Lake Shore Boulevard West, between The Gatehouse and Rabba. We had concerns about some of the other locations proposed earlier, but this one addresses our concerns in that it is in a highly visible location with adequate separation from naturalized areas and other significant wildlife habitat. 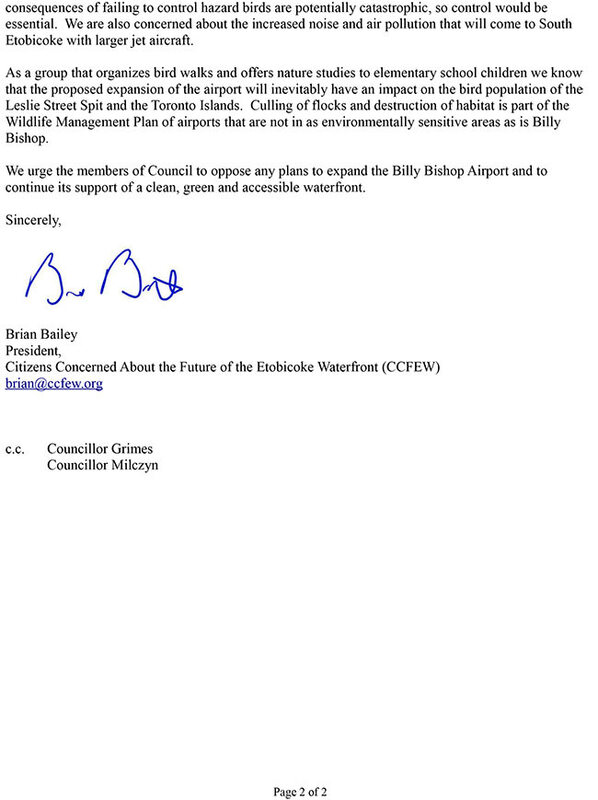 We have not taken a position in support of, or in opposition to the project. It's ultimate success will depend to a great extent on it's organization and management. Those details have not, to our knowledge, been established. Below is a map of the proposed site. 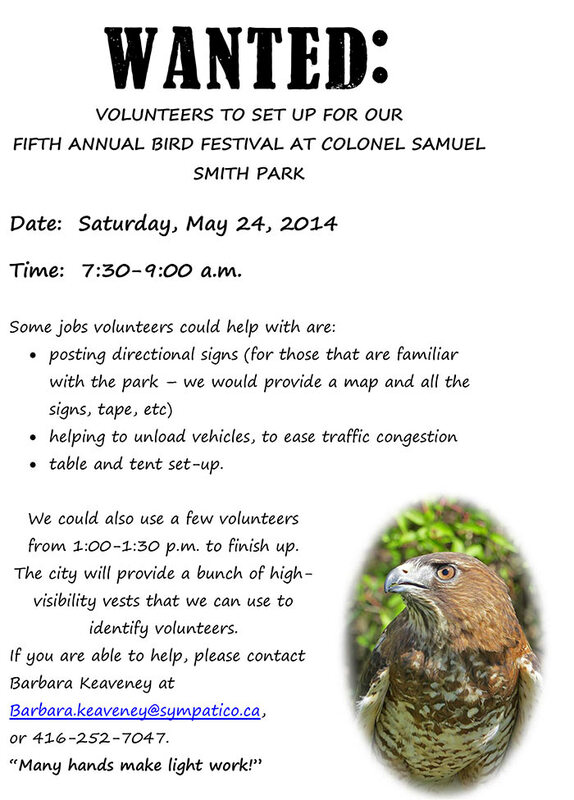 We have been trying to get nature education programming for schools established at Colonel Samuel Smith Park for many years (see below). While we were still celebrating the grant from the Gosling Foundation, we received another cheque last week, this time for $3000, from the McLean Foundation. 2014 looks like the year that this program will really get rolling! CCFEW’s most recent project is bringing nature programs for school groups into Colonel Samuel Smith Park in south Etobicoke. We have entered into a partnership with the Humber Arboretum, in north Etobicoke, to extend their nature programs to Colonel Samuel Smith Park in south Etobicoke, working out of classrooms on the south campus of Humber College, which is located right beside the park. The Humber Arboretum has offered programs at this south location for 2 years now in May and June, led by professional nature interpreters. CCFEW has been subsidizing these programs with a specific financial subsidy of $5 per student for 2 years, so that as many students as possible could take advantage of this wonderful environmental education opportunity. CCFEW contributed $675 towards this project in 2012, and another $750 in 2013, meaning that 285 students were able to attend a subsidized program, and only had to pay $5.50 for a full-day of nature education. 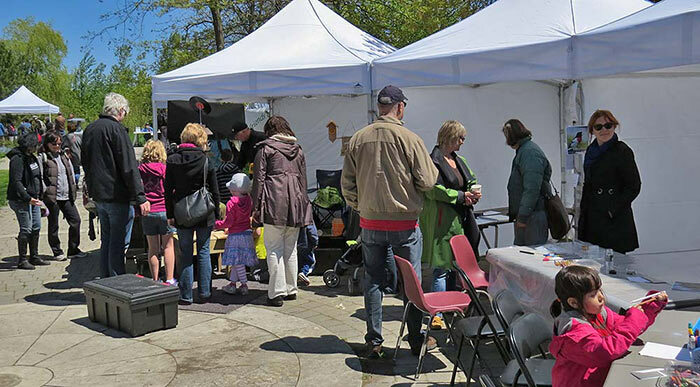 These subsidies were financed by CCFEW membership dues, and money donated by “Birds and Beans Coffee Shop” in Mimico from donations at the Spring Bird Festival. We are very pleased to announce that The Gosling Foundation has generously given CCFEW and the Humber Arboretum a grant of $1000 towards subsidizing these nature programs in 2014. We are hoping to extend these programs to March and April if possible, as well as May and June. This has been a very successful program, with a bright future ahead. Birds and Beans has generously donated copies of their beautiful 2014 calendar to all our members. We will be working to distribute them over the next couple of weeks. eBird, an on-line bird records database recently developed a “Hotspot” tool that, among other things, summarizes data from locations known to be good places to find birds: hotspots. According to this database, 237 different species of bird have been recorded in the park. That is a testament to diversity and quality of the habitats found at this city park. From the eBird database, here’s a list of the top ten Toronto hotspots (in terms of number of species) as of December 2, 2013. The proximity of the #6 hotspot, Humber Bay Park East, to an ever growing wall of condominiums certainly gives us pause. None of the other top 10 hotspots have tall buildings nearly as close. Also, more than most of those top 10 locations, the majority of the birds found at Humber Bay are migrants. It may soon be the #1 hotspot for FLAP.